"Sampath Speaking" - the thoughts of an Insurer from Thiruvallikkeni: Fish, how much ! 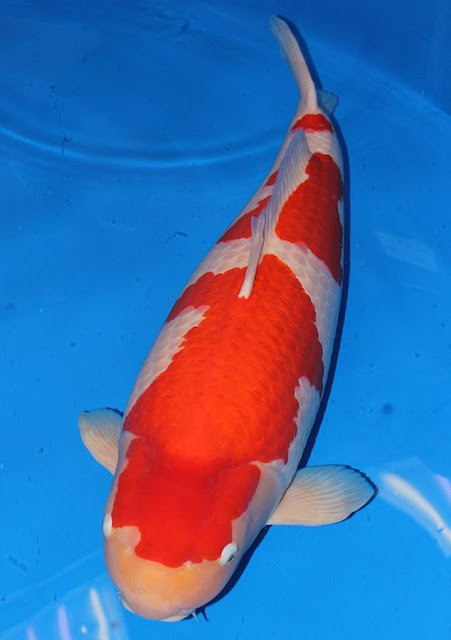 ~ costliest Koi Carp at 203 million Yen !! Fish, how much ! 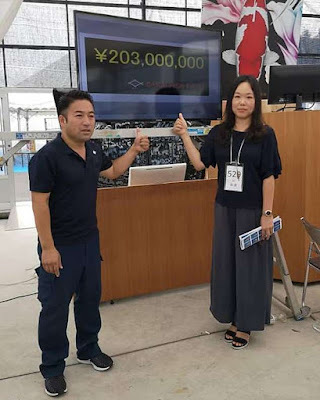 ~ costliest Koi Carp at 203 million Yen !! In Sangam literature, “Neithal” is the landscape of Sea, shore and related things. Water is always an attraction – the sea, the river or the pond (the mightiest, the flowing one or the still water) – in whatever form have their own charm. Standing near a waterbody watching fishes swim, can be a great stress reliever. In Aquarium or in a small tank, you can observe them more – the vertebrates swinging their fins are unbridled attraction – whether they get too cramped and feel uneasy would never be known to us though. The Japanese Koi, a group of fish that are ornamental varieties of domesticated common carp are grown for decorative looks. The koi carp represents good fortune in Chinese culture since time immemorial. In the modern World where most time is spent on web and social media, this fish is at the heart of a huge internet crowd that is sharing images of the fish in the hope of a little blessing, be it to pass an exam or for the speedy recovery from sickness. Koi Carp King, a verified Weibo account with more than 16 million followers, sends out daily postings encouraging people to repost and leave their wishes in the comments. Each post, tagged as “daily superstition”, receives thousands, even tens of thousands, of comments, likes and reposts. Rather than the net image, It is so enchanting to keep looking at live fish swimming whether in a pond or in an aquarium. Fish keeping is a popular hobby which sure would give you lot of mental peace and tranquility. Aqua is a Latin word meaning water and ‘arium’ is a place relating to. There are very big aquariums in some Countries where humans walk inside and from the sides can view the marine animals in their natural best. There are aquariums with big tubs in which fish and other aquatic creatures are kept. At home, even a bottle would serve as an aquarium for keeping fishes like Gold fish, Angel, molly, Guppies etc., The fish tanks are generally rectangular in shape but would include glass bowls to keep gold fishes. Then there are ponds – big or small, artificial or natural – that stocks fish. In ThiruvallikkeniKairavinipushkarini, Corporation used to breed guppies – those guppies would be taken in small earthen pots and dispensed to all wells in the vicinity – guppies would feed on the larvae of mosquito and effectively control them. Now read this interesting, sort of unbelievable post in Daily Mail UK on the World's most expensive Koi Carp which reportedly has been bought for £1 million more than previous world record. The reports states that - S Legend, a 3ft 3ins Koi Carp, has been sold for a record amount in Hiroshima. 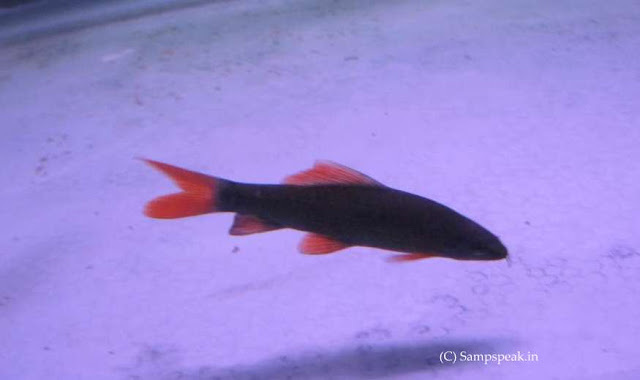 The red and white fish is nine years old and was subject to a fierce bidding war; She was bought by a woman called Miss Yingying from Taiwan. The Kohaku variety fish will stay in Japan and take part in a national Koi Carp competition where the prize money is... nothing. For those interested, this Koi Carp fish has been bought in an auction in Japan for a record £1.4 million - £[13.14 crores] [203 million Yen] !!! - 1 million than the previous highest bid.The 3ft 3ins long red and white fish was bought by a collector from Taiwan after a fierce bidding war at the Saki Fish farm in the city of Hiroshima.The female Koi, which has the name S Legend, is of the Kohaku variety and the most recognisable among the many varieties of carp that can be bought.Miss Yingying from Taiwan emerged the successful bidder, buying the fish from breeder Kentaro Sakai for 203 million Yen. She plans to leave the nine-year-old fish to compete in the All Japan Koi Show where it is expected to win for a second year running.Although there is no prize money for winning, the prestige of taking the title two years in a row will only enhance the reputation of the fish, according to British Koi expert Tim Waddington. 'Not much is known about the woman who bought the fish other than she is called Miss Yingying and is from Taiwan.’Photos from the auction – and the winning bid – were posted on the Facebook page of the world-famous Saki Fish farm which has been breeding Koi for over 100 years.Fans and collectors of Koi Carp will travel from all over the world to get a glimpse of the £1.4m fish.Mr Waddington, 43, from Warrington, Cheshire, has visited Japan over 60 times to source Koi Carp for clients in the UK. 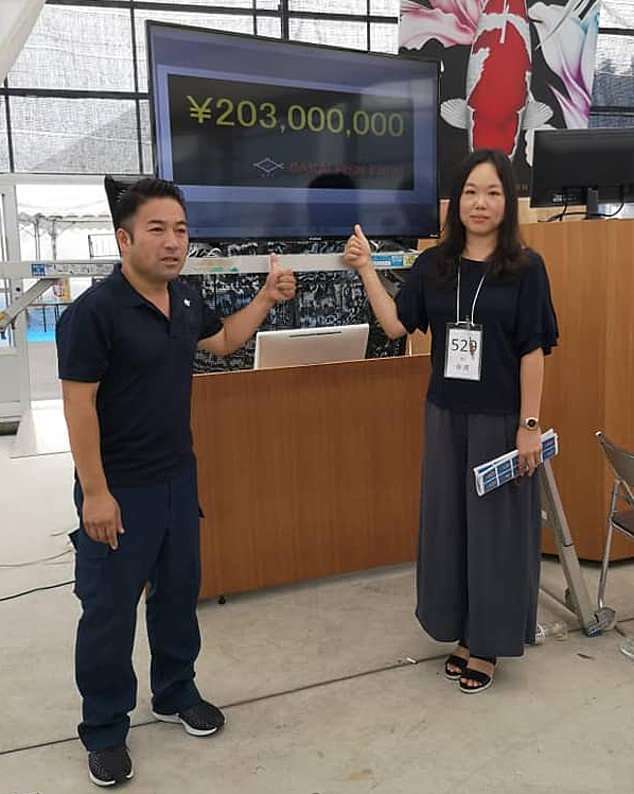 He will be travelling to see the most expensive Koi in early 2019 when it is expected to be in Tokyo for the All Japan Show. Although there is no prize money for winning, the prestige of taking the title two years in a row will only enhance the reputation of the fish, according to experts. The new owner will have the opportunity to breed the fish which has the potential produce up to 500,000 eggs, of which no more than 5,000 will be of the right quality to sell ! ~ it is further stated that ‘Koi can live up to the age of 25 but it is likely with this one that it will continue to compete in shows for another two years. 'It really is a crazy world.' Koi Carp, which originated in Japan, come in more than a dozen varieties and are distinguished by their colouring, patterning, and scalation. The Kohaku variety is a white-skinned koi, with large red markings on the top. To be the perfect Kohaku the white has to be pristine without any discolouration of yellowing.Translated into English the name means red and white and Kohaku was the first ornamental variety to be established in Japan.While £1.4 million is a record sale collector of Koi collectors can fill their ornamental ponds with other varieties that can cost as little as £12.50.Japan remains the biggest producer of Koi with 90 per cent of production destined for export.